A visit this afternoon to spend a moment with Steve Nolan, at Kempsey. 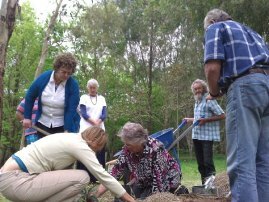 Planting a fig tree in Steve’s honour, one year on. On the first anniversary, twelve months since Steve’s death (24th September, 2010), we gathered, a dozen or so of us, at the truck ramp passed the chicken shed to honour this extraordinary, ordinary man-mystic of love and power, by placing in the earth he loved, a fig tree seedling (ficus macrophylla) that comes from the Carroll farm, Majors Creek, Macleay Valley. In the days before his death Steve would contemplate a flower, transfixed upon its eternity and its revelation of heaven here and now. He reminded us of how immediate is the “More”, the Divine, the Sacred; not something to wait for after death, but here within reach. But only he or she who sees, takes off their shoes.